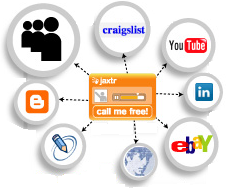 Jaxtr lets you place a call for free widget on your website. A site visitor will type a phone number and the system will call automatically both your registered phone and visitor specified phone and then link the calls. At this moment Jaxtr is a free service. Users will receive a limited amount of minutes for free after which their calls will be redirected to voicemail.